A good anti-fatigue mat should be designed for heavy use in your specific work environment. Anti fatigue mats intended for use in the shop may not be suitable for use in a kitchen environment, as the two locations have different requirements to be met. Features that go into the best anti fatigue mats include stain resistance and the ability to hold their shape under heavy use without wrinkling, imprinting or curling along the edges. Some mats are better suited for conditions where equipment must be rolled over the surface of the mat, and that should be taken into consideration before choosing the best mat for your garage. Soft mats plus heavy equipment being rolled over them isn’t a good combination. Combine with a good shop stool, and you’ll stay comfortable whether sitting or standing. Imprint Comfort Mats have just the right amount of padding for you to wear any type of shoe, or work in socks or even barefeet if you desire. 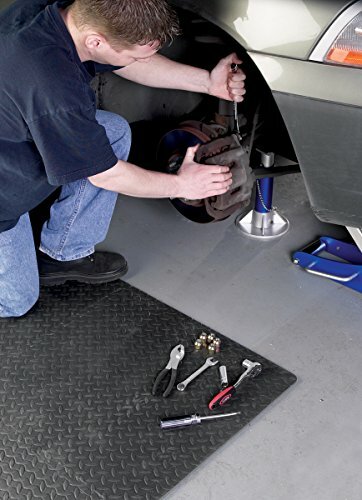 While marketed more as a kitchen mat, it’s actually a fantastic 3/4″ thick anti-fatigue mat for your garage. Available in sizes from 20×36 to 26×72 inches, you’ll appreciate the way this mat reduces discomfort due to standing in one place for long periods of time. It does a great job to relieve foot and lower back pain many people get from standing on bare floors. Imprint Comfort Mats provide support consistent with gel mats, at a much lower price. The Imprint Comfort Mat is not designed for use in wet environments, and may slip under such conditions. If you are going to use them in this way, it may be a good idea to use double-sided tape around the lower edges to provide additional friction. The only real problem with the design is that the mat is not beveled down to a fine edge. Instead, it has a small seam running all the way around the border. This creates slightly raised edges which some people say creates a trip hazard, but this is not a common problem. The mats can be placed side by side for larger coverage, but the tapered edge will create dips where mat edges touch. If your workstation keeps you in one place most of the time, a single Imprint Comfort Mat is the ideal solution. The only real improvement that could be made to the Imprint Comfort Mat would be to make them with interlocking edges so you could cover an entire surface area. If you have a large work area, the Wilmar W88989 may be the best anti-fatigue mat for the money. Each mat is made with interlocking edges that allow you to combine mats for a continuous, comfortable flooring. To make this easier for you, the edges are created using special interlocking strips that can be removed when putting multiple mats together so that there is no discernible difference where the mats connect together. The biggest disadvantage of a Wilmar Interlocking Floor mat is that the mats have a tendency to slip on floors which are wet or have smooth finishes. They work great on carpet, concrete or other semi-smooth surfaces, but may not fit your needs in a kitchen environment. As a garage-only mat? One of the (if not THE) best mats out there. Each package contains a full 24 square feet of flooring, with 6 individual 24 inch by 24 inch mats. 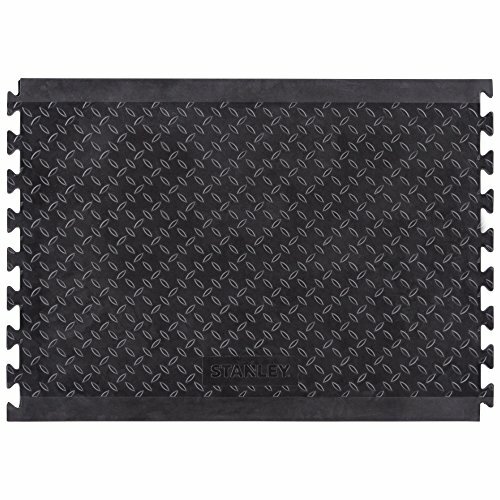 Stanley utility mats are built with the same quality standards as other Stanley products. The cushioning is designed for long lasting comfort and will not wear down after standing in one spot for long periods. The Stanley mat is nearly an inch thick, which means additional support that is ideal if you typically have trouble remaining in a standing position. It is made from industrial grade material and does not slip on a wet floor the way some anti-fatigue mats will do. 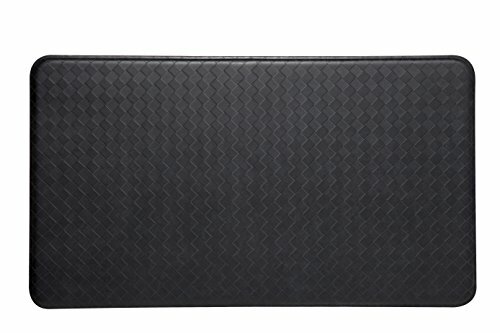 Because it’s suitable for heavy-duty use, it is one of the best anti-fatigue mats you can find. A Stanley Utility Mat stands up to use in a kitchen environment where the floors may be wet for longer periods. The beveled edges are ideal for situations where you have to roll items over them regularly such as when sitting on your shop stool or creeper seat, a feature that other mats do not meet as well.